The rod seal is the most critical seal on any type of fluid power equipment preventing leakage of fluid from within the cylinder to the outside. Leakage through the rod seal can reduce equipment performance, and also in extreme cases can cause environmental issues. 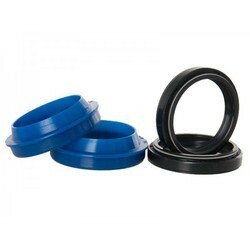 We are one of the foremost firms of Rubber Rod Seal. Sealing Solution for Hydraulics Cylinders. Expertise in manufacturing of diffeent profiles of Rod seals in different elastomers, we supply the cheapest rod seals at best quality. If you have specific requirement, we have the solution for you. All sizes are feasible. Please Contact to us for further details. A Rod seal is captured in a groove or fixed in a combination of rings, forming a seal assembly, to block or separate fluid in reciprocating motion applications.Rod seals are hydraulic seals ideally suited for heavy-duty mobile and stationary service where leakage must be held to an absolute minimum. Bs is a lip seal with a secondary sealing lip and tight fit at the outer diameter. Wear and dry run are largely prevented by the additional lubricant retained under the seal by the secondary lip. bs is mainly designed for the sealing of piston rods and plungers in heavy duty applications in mobile and stationary hydraulics. 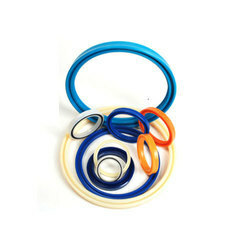 - Hindustan Oil Seal Manufacturing Co. is a trusted name in manufacturing Rod Seals made from Nitrile, Neoprene, Viton and Polyrethene. - These rod seals are the ones found in the hydraulic cylinder. The rod seal is often the decisive factor for the function of the hydraulic cylinder in its entirety. Our different varieties of Rod Seals are developed from fine materials and could be used for both single acting and double acting cylinders. These are offered in different specifications, sizes, dimensions and these are known for high chemical resistance and resistance to radioactive environments.